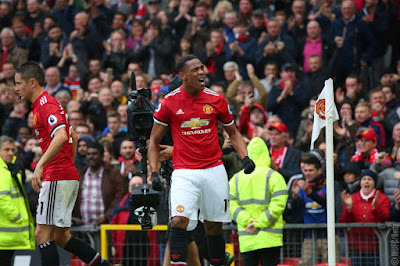 Goals from Antonio Valencia and a double from the in-form Jesse Lingard were enough to see off an Arsenal side who had not lost at home since January. But the Reds' superb victory was down in no small part to De Gea, who was in scintillating form. The only negative of the afternoon was the red card for Paul Pogba, who will miss the next three matches including next Sunday's huge derby clash. Both sides were unchanged from their midweek victories, with Nemanja Matic deemed fit enough to start after going off injured at Watford and Alexandre Lacazette also selected despite being initially being ruled out of the game with a groin injury. The Gunners were on a 12-game winning run on their own patch, but the hosts were the architects of their own downfall early on with the Reds ahead inside four minutes. Laurent Koscielny's pass to Sead Kolasinac was easily intercepted by Valencia who played a one-two with Pogba before slotting home brilliantly through the legs of Petr Cech. Seven minutes later, Arsenal lost possession again and United took full advantage. 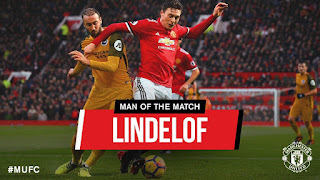 Lingard flicked the ball off Shkodran Mustafi’s toe and found Romelu Lukaku who slipped a pass into Anthony Martial and the Frenchman’s sublime lay-off allowed Lingard to instantly sweep the ball in off the post. 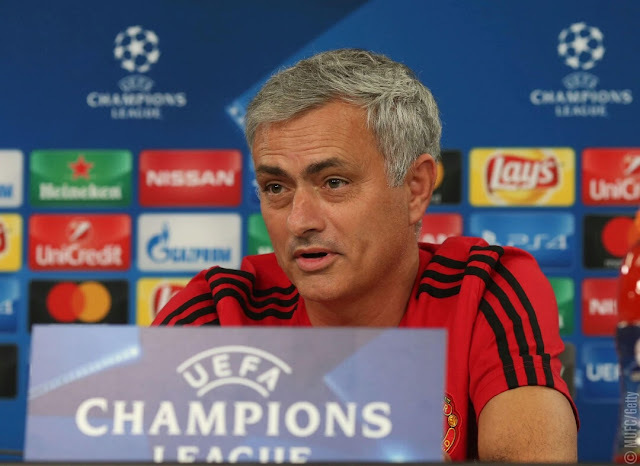 The Reds looked almost unstoppable in attack, but Mourinho’s men were thankful for a combination of vital De Gea saves and some last-ditch defending which ensured United ended the half well in control. De Gea knew little about his first brilliant stop as Lacazette’s shot deflected off the keeper on the ground and up onto the bar, before Granit Xhaka fired just wide. The Spaniard held on to a well-struck Mesut Ozil volley, before pulling off a superb double save, diving to palm away Hector Bellerin’s drive and then claiming Kolasinac’s bobbling effort. The best save of the lot though came on the stroke of half-time, and from his own player. 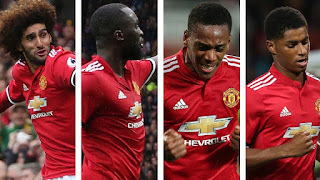 An Alexis Sanchez free-kick was swung in and the ball ricocheted off Lukaku forcing De Gea to claw the ball away from almost inside his own net. 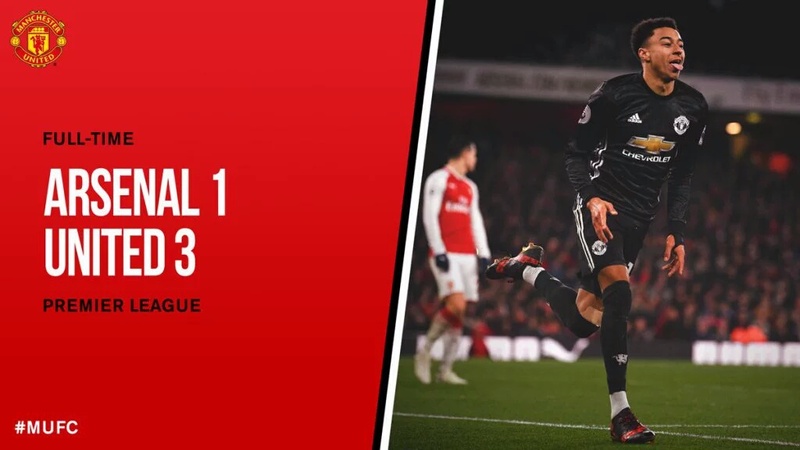 Four minutes after half-time, De Gea could do nothing to prevent the Gunners grabbing one back as Sanchez’s cross found Ramsey, who had burst through the defence which stood still expecting offside and could only watch on as Lacazette fired the ball home. 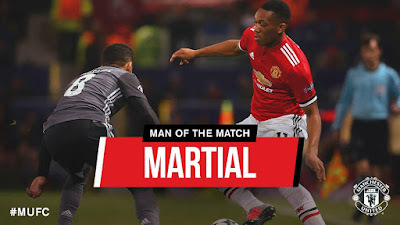 United responded almost immediately as Lingard found himself through at the other end and, after Cech had deflected his attempted chip onto the post, Martial’s follow-up from a matter of three yards rebounded back off Nacho Monreal and away from danger. It was time for more De Gea heroics on 55 minutes when the stopper saved one-handed from Lacazette, before reacting immediately to block Sanchez’s effort from point-blank range with his foot. There was to be no let-up in the action as United reclaimed the two-goal advantage quite brilliantly just after the hour-mark. Lukaku set Lingard clear who found Pogba down the right and the marauding midfielder held off the attentions of Koscielny to cross for Lingard to tap into an empty net. 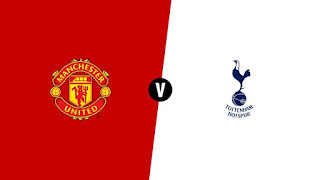 You hoped that would be enough for United to see out the game but things were made more difficult when Pogba was shown a red card for a foul on Bellerin on 74 minutes. A three-match ban is expected to follow with the Frenchman set to be a massive miss in next weekend’s Manchester derby. More De Gea saves and a couple of penalty claims by Arsenal followed but United held out for a vital victory in one of the most absorbing encouters of the season. Now for the derby. Arsenal: Cech; Koscielny (c), Mustafi (Iwobi 15), Monreal; Bellerin, Ramsey, Xhaka (Welbeck 70), Kolasinac (Giroud 77); Ozil, Sanchez; Lacazette. Booked : Bellerein, Koscielny, Sanchez. Subs not used : Ospina (GK), Mertesacker, Coquelin, Wilshere. United : De Gea; Valencia (c), Lindelof, Smalling, Rojo, Young (Rashford 90); Matic, Pogba; Lingard (Darmian 76), Martial (Herrera 67); Lukaku. Subs not used : Romero, Blind, McTominay, Mata.